Designed At – Public Art Creative Consultants Ltd.
Design: Arber @ Public Art. Merci: Ant1 & Ludo Pour H5. 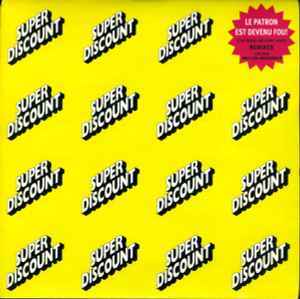 Original version appears on the "Super Discount" album (DIF 002). ℗ 1997 Disques Solid. © 1997 Different Recordings. Marketed in the UK by PIAS [Recordings] and distributed by Charged/Vital. Having bought this in 97', at an impressionable age & right in the middle of a strong wave of UK deep house/techno, I fell in love with both mixes. Weatherall & Tenniswood's contribution for obvious reasons (Just have a listen...), however the surprise was the EDC/Solid Crew mix- it's slack arsed wonky dub disco thing reminds me of better days in dance music when the industry supported quality over formulation & you would here a broad creative range of music from just one DJ as the norm. I guess the aftermath of Acid-House was still echoing around in the UK & somehow a lot of the French stuff had that unusual 'foreign' factor that found favour over here. Anyways, congas, disco hats, dub & delay- its a winner still today.